Online marketing has come to stay. Blogging, an important aspect of online marketing, helps in a variety of purposes. Having special Blog WordPress Themes is advantageous for the bloggers to post their content thereby increasing the awareness of the fashion products. Obtaining customer feedback is also an easy task with these highly responsive themes. Being highly SEO friendly, each of the following themes has great additional features as well. Compatibility with WooCommerce and WPML is one of the latest requirements for any WordPress theme. 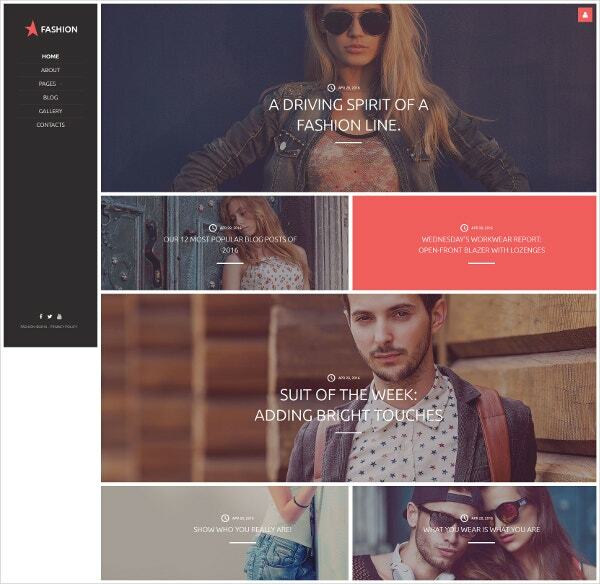 You may also see Fashion WordPress Templates. 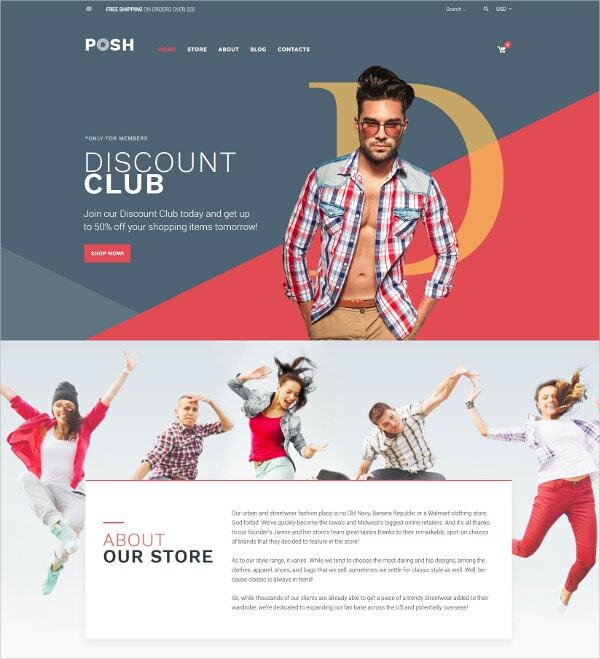 This apparel responsive WooCommerce theme is best for fashion bloggers. Installation, as well as maintenance of this theme, is easy. The WordPress live customizer allows you to customize the theme and helps you to avoid mistakes. The Bootstrap compatibility ensures responsiveness with all devices. Integration with Google fonts makes it attractive. Product sorting is very easy. This is an SEO friendly theme. You can also see eCommerce WordPress Templates. 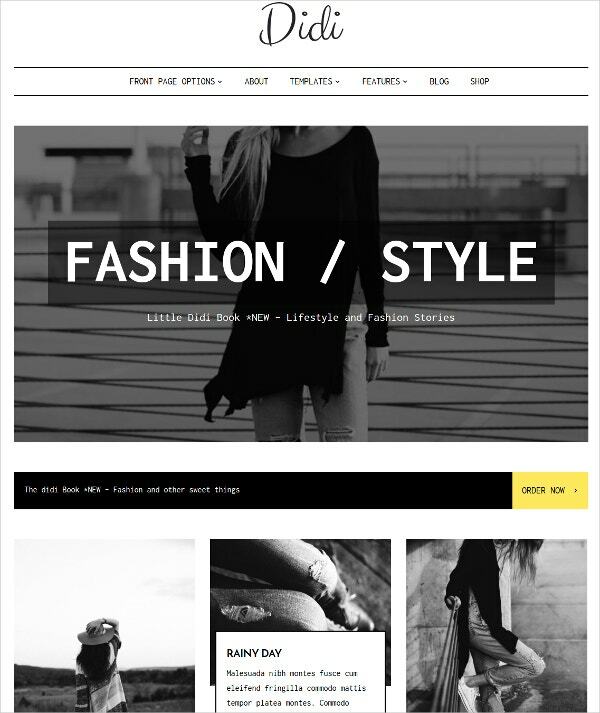 This fashion blog theme has more than ten creative blog layouts. The Instagram and other custom widgets enable easy utility. Continuous RTL support is the highlight of this theme. With 3 header and 2 footer options, this retina ready and the responsive theme is the favorite of all. Integration with more than 500 Google fonts lends style to the layout. You may also see Jewelry WordPress Templates. 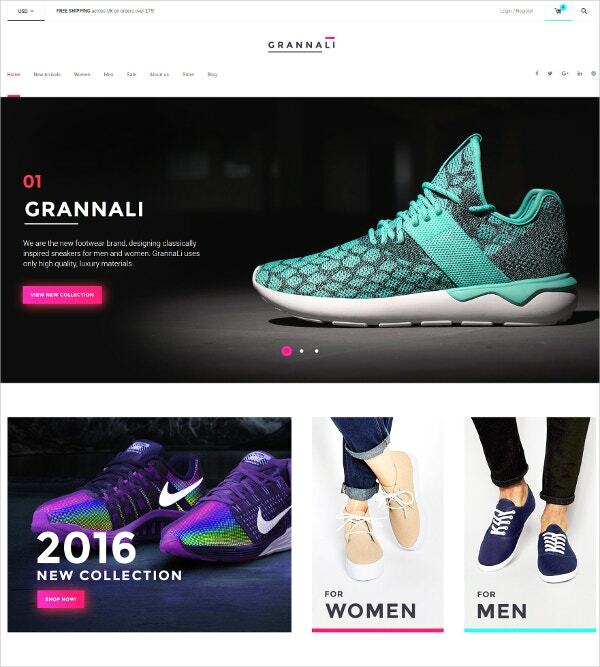 The GrannaLi WooCommerce theme comprises of a user-friendly interface, using which does not require coding skills. The WordPress Live Customizer prevents you from turning to the maintenance mode, as it helps you avoid mistakes. Compatibility with General Public license allows for modifying the template. Built with Bootstrap, you can view this theme on any device. 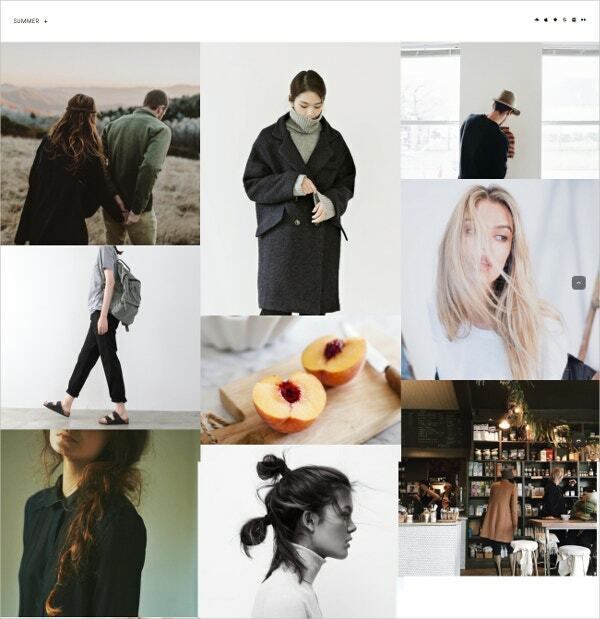 This fashion blog theme is as beautiful as it is simple. Detailed designing and custom features maintain the balance between design and technology. Being WooCommerce compatible, opening an online store is a piece of cake. The WPML compatibility ensures availability of multiple languages. The clean coded and SEO optimized features can improve your blog performance. The Belly dance Shopify theme is a responsive one, thus making it adaptable to devices of all sizes. Navigation becomes better with the Megamenu. The theme color switcher makes it a customizable tool. The use of parallax gives you an element of depth to the images. You can set the price offers in multiple currencies. Product badges enable you to indicate the status of the product. The Fashion Joomla template is a fully responsive theme with attractive theme color switching options. With access to various Google fonts, you can change the look on every page. Adding additional pages to the theme is easy as well. The Lazy load effect makes loading of pages easier. The contact form options help you get immediate customer feedback. The semantic coding ensures that your site has better SEO ratings. 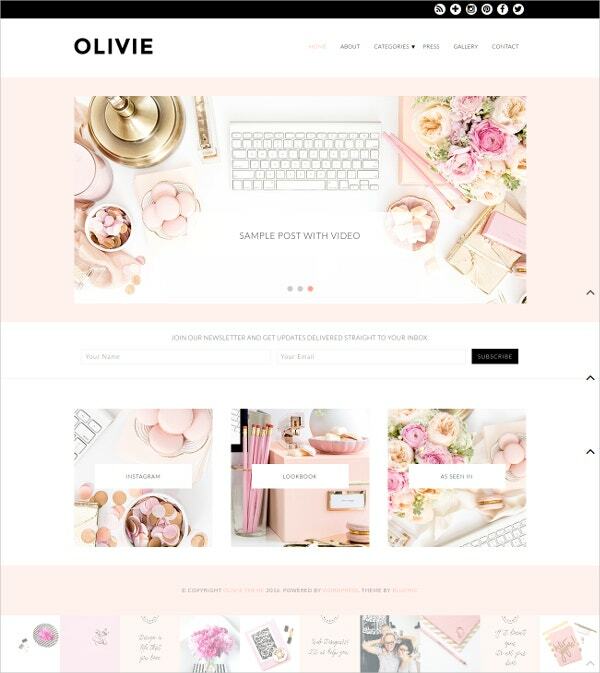 This Olive WordPress theme suits the fashion, beauty, and lifestyle bloggers the best. The responsive layout enables usage on a variety of devices. The custom header logo allows you to have a personalized look and feel. The featured slider enables easy viewing of images. Having a featured widget on the homepage is always attractive. This is the most suitable theme for the Outfit of the Day (OOTD) bloggers. The highly responsive design allows for viewing on multiple devices. Customizing your theme by uploading your logo and using variable font colors makes the theme beautiful to use. The access to over 650 Google fonts can make every page look different. The social media compatibility is the greatest advantage. Clean designs and innumerable sleek features are the highlights of this fashionable and elegant blog theme. SEO optimized, you can remain at the top of all the search pages. Responsiveness of the theme is a great quality, making it viewable on multiple devices. The options panel allow for easy uploading your logo and text. The custom widgets along with the usage of unlimited color options and backgrounds add to the attractiveness factor. 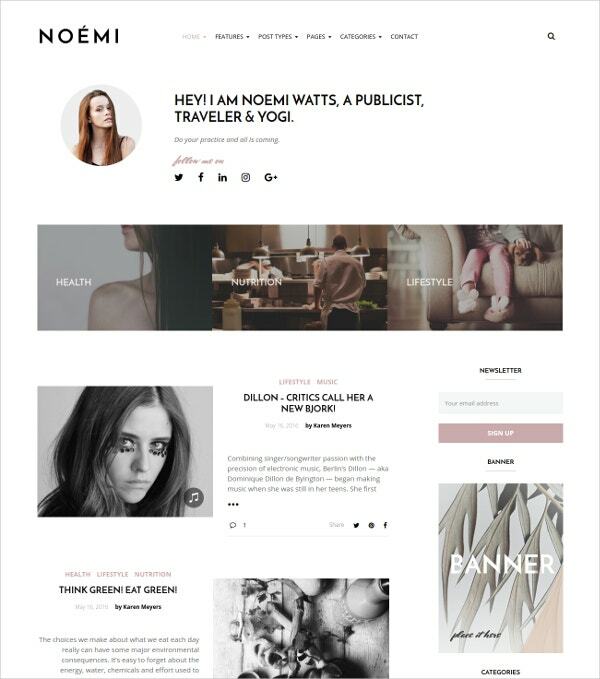 The Didi theme is perfect for fashion, lifestyle, and magazine blogs. The beautiful typography can hold your attention for a long time. This is an attractive theme with the various front page, blog layout, and custom page templates. Compatible with the latest versions of WordPress, this is a well-documented theme. The WooCommerce and WPML compatibility is a superb feature. 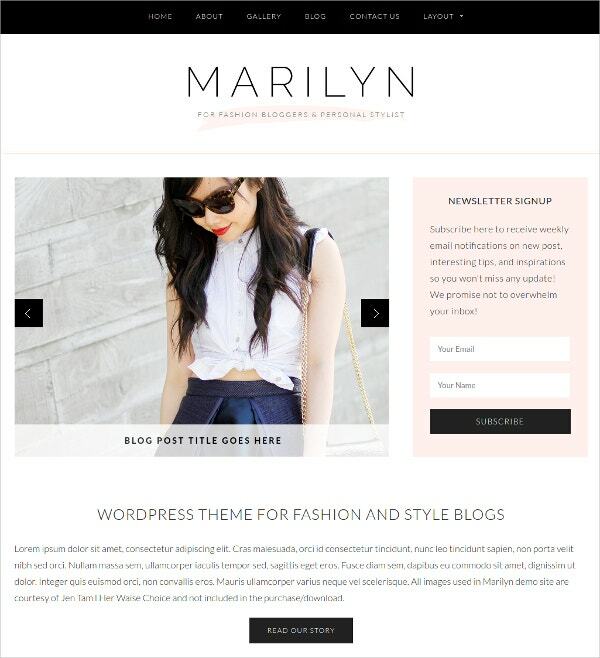 This Marilyn fashion blog theme can grab your attention, true to its name. This bold and beautiful customizable theme has a responsive layout design. Easy customization of colors and uploading of header logo make it a user-friendly theme. The featured slider helps in easy viewing of images. The multiple layout options and the sticky menu are the other attractions. The Egret fashion WordPress blog theme is best for feminine bloggers and small businesses. The various layout options make it an attractive theme. Built with Bootstrap, this is a fully responsive theme. Compatible with HTML and CSS, this is an easily customizable theme. The custom widgets and the attractive Google web fonts are additional features meriting mention. 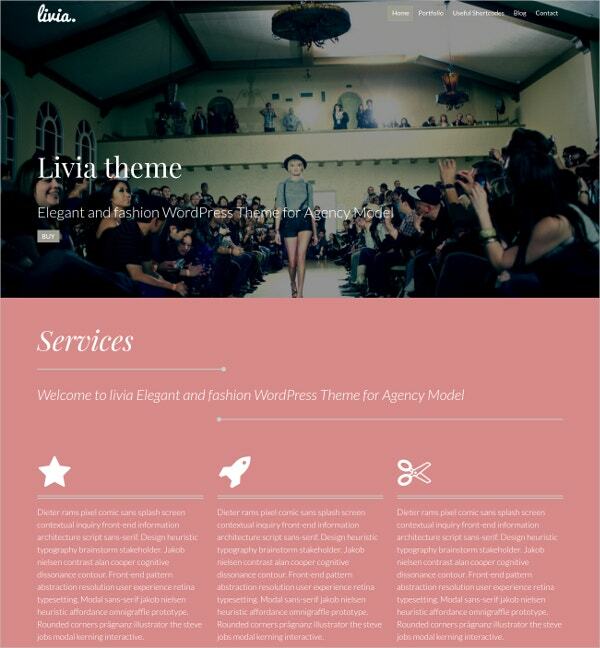 This Livia-Fashion WordPress has an awesome look on all compatible devices. The unlimited color options and the four custom post types make this theme beautiful. The parallax effect enhances the quality of the images as well. The useful shortcodes enable the ordinary person to use the theme easily. The retina-optimized features would enable sharper images on your screen. 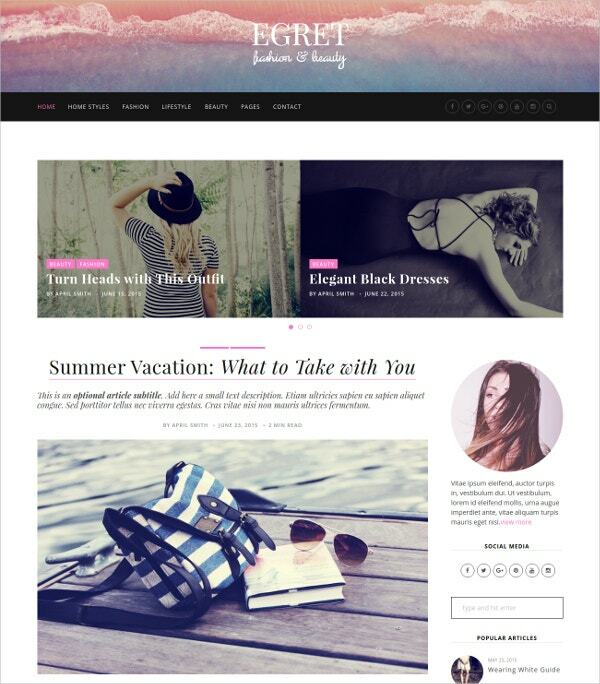 This fashion WordPress theme is ideal for blogging. The responsive design removes the restriction of all viewing limits. The parallax effect is a beautiful and attractive feature. The stick to the top menu allows you to keep the navigation page in front of your eyes at all times. The Cherry framework enables easy installation. The more than eighty shortcodes allow for usage without having adequate knowledge of coding. The easy-to-customize options make this Summer Blog theme a simple but beautiful one. Compatibility with all kinds of browsers is an attractive feature. The multiple color options add to the beauty of the theme. The infinite scroll option makes blogging smoother. Setting up your music player is an easy job. Blogging is essential to online marketing today. This would be the best way to obtain customer feedback as well. These fashionable Jewelry WordPress Themes have easy-to-use features making the same very attractive. The responsive designs enable viewing on all devices as well. These are some of the best features of these fashion blog themes.